This is a large, long-lived, fritillary butterfly. The wingspan is 2½″ to 3½″. The upperside of both wings are orange, orangish-brown toward the center, with black stripes, spots, and chevrons. On the outer margin there is a band (marginal band) of spots that have dark borders and are separated by heavy, dark veins. On most individuals all of the spots in this band on the forewing are orange and distinct, even at the wing tip. On some individuals the spots on the forewing band are brown or brownish tinged, especially toward the wing tip. The spots on the hindwing band are always orange, never black. There is a submarginal band of chevron-shaped black spots, a postmedial band of round black spots, and a medial band with black stripes. The wing veins of the middle portion of the forewing are bordered with black scales, making them appear thick. The underside of the forewing is mostly orange, orangish-brown toward the center, with an orangish-brown marginal band, black markings mirroring those on the upperside, and a few small white spots near the tip. The underside of the hindwing is reddish-brown, with a reddish-brown marginal band, a submarginal row of 7 silvery spots, a postmedial row of 6 large and 1 small silvery spots, and several silvery spots in the discal area. The two rows of spots are separated by a wide yellowish band. The yellowish band partially surrounds all of the postmedial spots. Females are larger and darker than males. The caterpillar is mostly black and up to 2¼″ long. The head is orange above, black below. Each abdominal segment has 5 branched, spike-like projections (scoli), one on the upper (dorsal) surface, and on each side one in the subdorsal area and one in the spiracular area. The lower half of all of the scoli are orange or tan. Mature caterpillars are found in May and June. 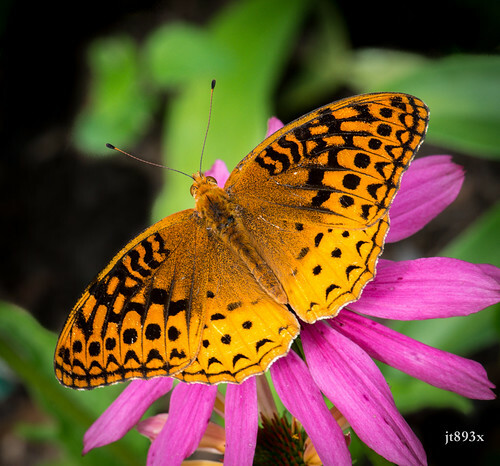 Aphrodite fritillary (Speyeria aphrodite) is a slightly smaller butterfly, with a wingspan no more than 3¼″. On most individuals all of the spots in marginal band of the upperside of the forewing, especially toward the wing tip, are black and indistinct, giving the appearance of a broad black border. The wing veins of the middle portion of the forewing are thin. There is an “extra” black spot at the base of the forewing. On the underside of the forewing the white spots at the tip are larger. The yellowish band separating the rows of silvery spots on the underside of the hindwing, if present, is narrow and does not surround any part of the large postmedial spots. The eyes are yellowish-green. 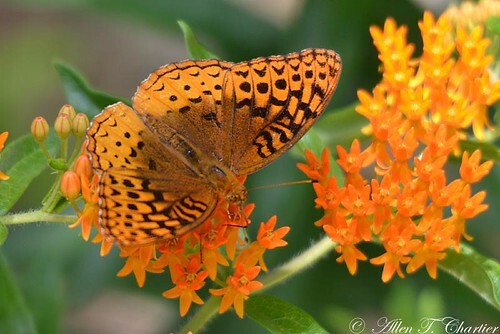 Atlantis fritillary (Speyeria atlantis) is a smaller butterfly. The outer band of the upper hindwing is mostly black. Nectar of violets, thistles, and other large flowers. Males emerge in mid-June or July, 2 to 4 weeks before the females. 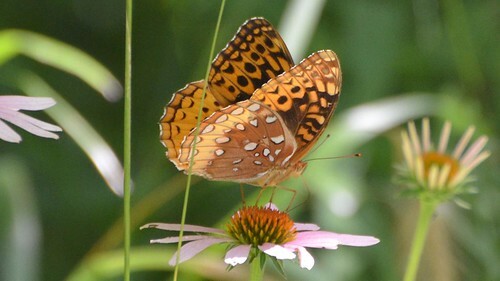 Mating occurs in open areas in July. Females lay eggs on or near violets in late summer. Males die in October, females in October or early September. The eggs hatch in the fall. The newly hatched caterpillars overwinter, not feeding until the spring. Along the banks of the Smith River, the nectar of sweet Joe-Pye-weed (Eupatorium purpureum) attracts and feeds a great spangled fritillary butterfly (Nymphalidae: Speyeria cybele cybele) Timothy Seaman performs "Samhradh, Samhradh (Trad. )", playing both hammer dulcimer and flute in this haunting melody from his album, "Wayfaring Stranger". This link to his website can help you to listen to more of his compositions. 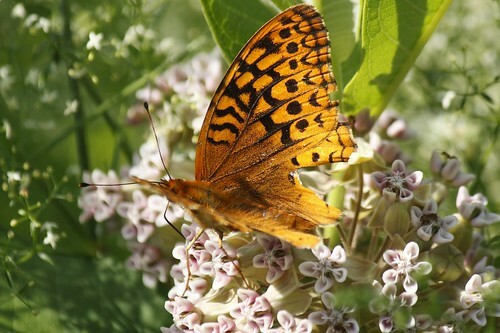 Great Spangled Fritillaries nectaring on Common Milkweed in Clermont County, Ohio, USA. June 4, 2010.